All New, All the time! Wondering where I've been? Well, inspired by others in the blogosphere, I've gone blogger-free. New England sock, on hold for months now. and the all-familiar Pomatomus (sorry about the uninspiring photography and weird angles. It was cold out). Thank you all for your lovely comments on my last post. Some of them made me tear up a little (but maybe I'm just feeling a little emotional these days). This weekend took me across the central mountains on some before-I-leave-Appalachia adventures. On Friday, I headed out to the Hindman Settlement School in Hindman, Kentucky for a meeting of the Mountain Music Teachers Association. Although I'm not really a member, it was interesting for fieldwork and, more importantly (to some), there was a good jam that night. When my fingers crapped out on me (I'm not used to playing guitar -- man, it kills your fingers if you don't have the right calluses! And I'm a wickedly bad fiddle player, so...), I knit. Pomatomus #2 also enjoyed the music (that's my friend James on the fiddle. I put his picture here because he laughed when I told him I had a knitting blog. Little does he know...). And (for those of you who lamented the loss of beautiful mountain scenery that will be caused by my northern migration) when I woke up in Hindman in the morning, there was a lovely coating of sparkling snow. Later Saturday afternoon, my friends Julie, Bethany, and James all headed down to North Carolina to hear the Red Stick Ramblers play at the Boone Saloon. A very, very good time was had by all, although I two-stepped so much that last night my knees were cracking like an old lady's and this morning my body hurt so much I could barely get up. A lot of time in the car, but well worth the drive. More knitting tomorrow. Sometimes, there's so much to say I don't want to say anything at all. That pretty much sums up the month of January -- posting irratically, going weeks without saying anything at all, not mentioning important things, missing anniversaries (my blogiversary was the 24th). But it's a new month, and I'm tired of putting off blogging because I have too much to write. So I'll begin with the news I've not been writing for the last two months. I'm moving back to Philly. This probably doesn't come as much of a surprise, given the number of trips I've made up there recently, although those trips have very little to do with my ultimate decision. This was an incredibly difficult decision for me to make, and one that even after I made it, I still didn't tell people about for months. I was ready to stay down here in the mountains for the long haul (y'all might remember), but the inherent isolation of dissertation-writing, combined with my physical isolation from friends and family, really took its toll this winter. Add to all of that the difficulty of writing what is turning out to be a fairly theory-heavy dissertation while three hours from a major research library, and... well... it's a recipe for slow writing. I'm ready to finish my dissertation and I'm ready to get on with my life. I love living here, and the thought of moving away makes me want to sit down and cry. But at the same time, I know now is the time to go. I've got to go back to Philly, a city I once loved with all my being, and face the ghosts that remain there. I've got amazing friends up there, a wonderful community, and now a terrific apartment waiting for me. It's just time. And if I wait until spring? Well, I'll never be able to go. It's just too damn pretty here in the spring. So... that's my news. 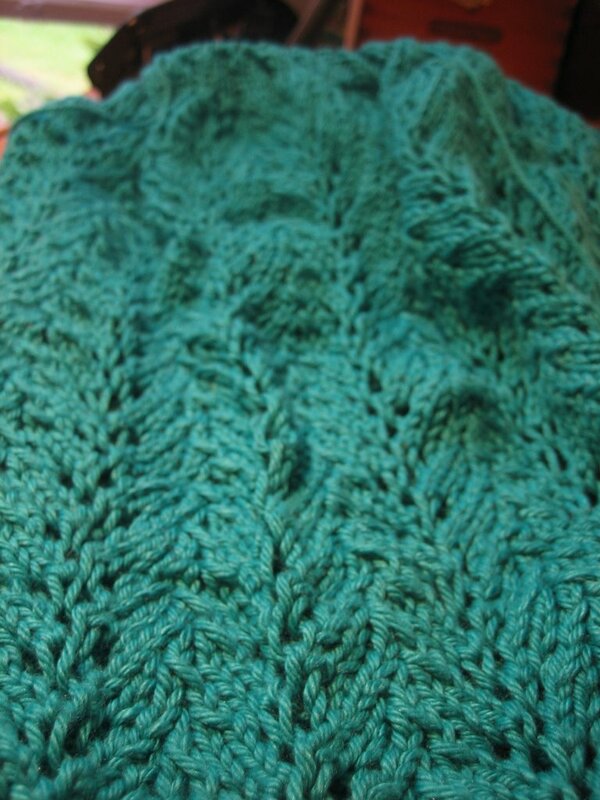 Despite not blogging, I've been knitting quite a bit. I have lots to post. First, and most proud, I learned to darn. Remember these? Not beautiful, but wearable. And I felt so old timey and resourceful while doing it. The first new skill of 2007... Thanks Theresa for your tutorial! I swear, I haven't dropped off the face of the planet. I'm in Philly. Again. I feel like I've been out of town more than in town these last few months, and it's led to some erratic blogging. 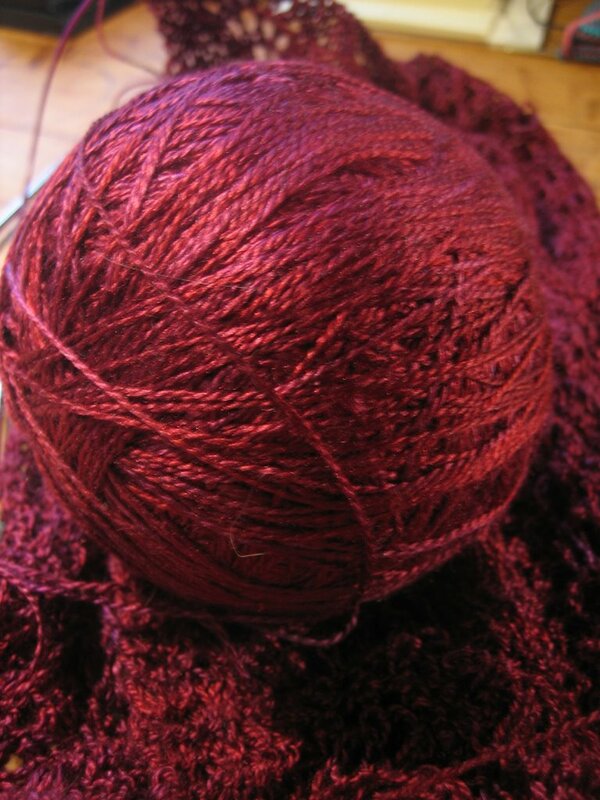 But -- there will be knitting, news, and photos when I return to the mountains this coming week. Your pomatomus sock questions will be answered (although they are not yet finished), hopefully there will be some endpaper mitts to display, and a new project to show off. See you soon! I would like to say, for the record, that ripping back an inch of the foot of the Pomotamus was the most hair-raising, terrifying experience of my brief knitting career. I hope never to have to rip something like that again. All I can say is THANK GOD for that US 000 needles. They were a life saver. So I treated myself to knitting on Pomotamus while watching Fog of War, which I netflixed ages ago and never had a chance to watch (can I interrupt myself to note that "to netflix" now seems like a completely acceptable verb? My how things have changed!). 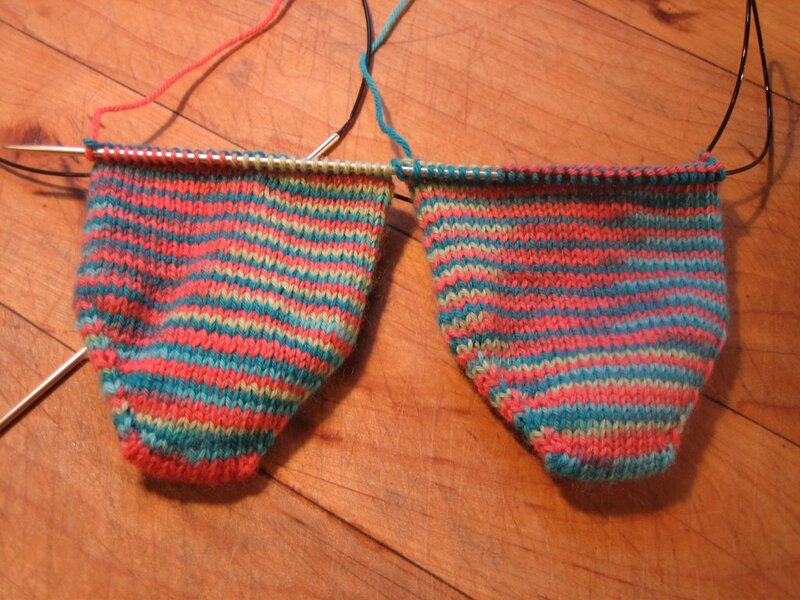 I was all set to post about the P-sock tonight -- how I first knit one a year ago, how hard it seemed, how I couldn't follow the pattern and how badly the sock turned out (so badly I actually didn't knit the second. This rarely happens). 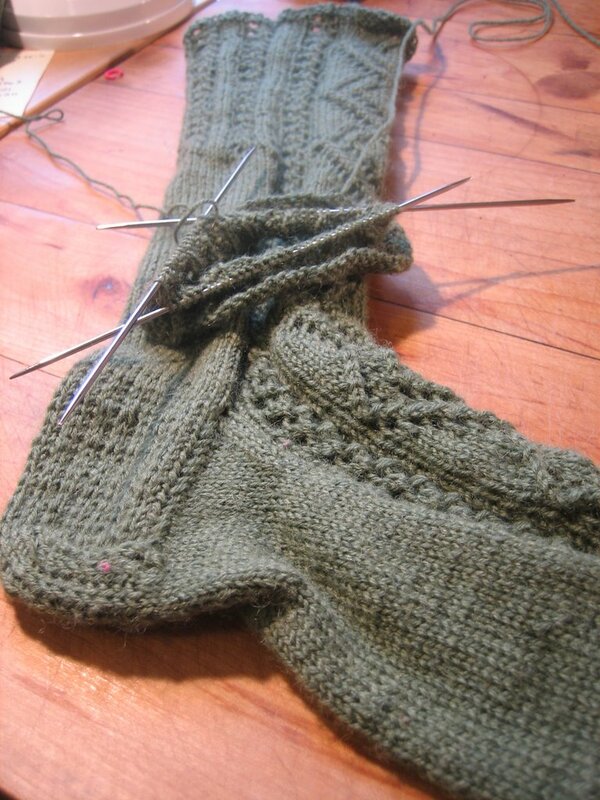 This time around, I flew through the first chart, all the way down the ankle, and turned the heel without even a second thought. 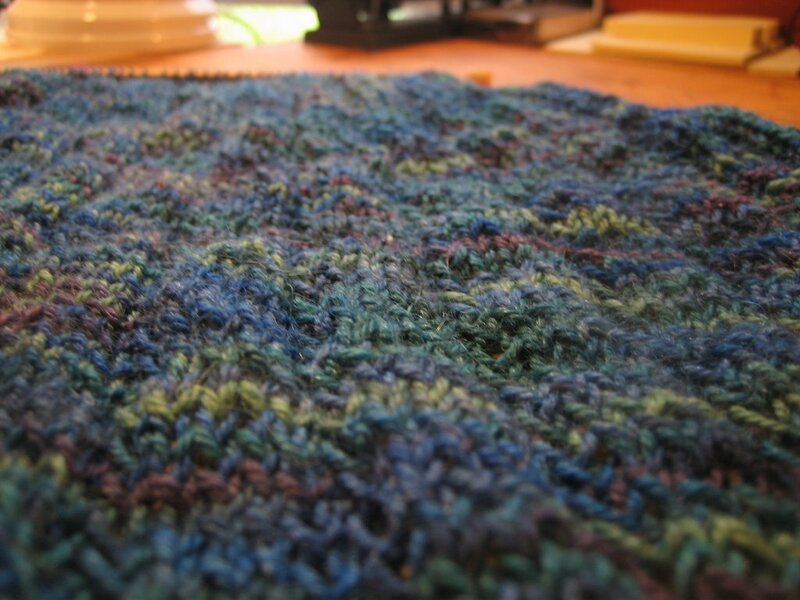 It was, to me, a testament to how much I've grown as a knitter in the last year. I had all of these back-patting thoughts planned for my post -- introspective musings about the measuring of progress, adult learning curves and such. But alas! It seems I don't always learn as fast as I think. Because half way through (of so I thought) the second foot chart, I take a moment to actually consult the chart. And lo! I effed up. Damn. I effed up in a way that can't be easily fixed. I was so frustrated, I had to set it aside. I'll figure out how to rip back a sock full of twisted stitches tomorrow. But I'm worried... could this be a sign of the times to come? 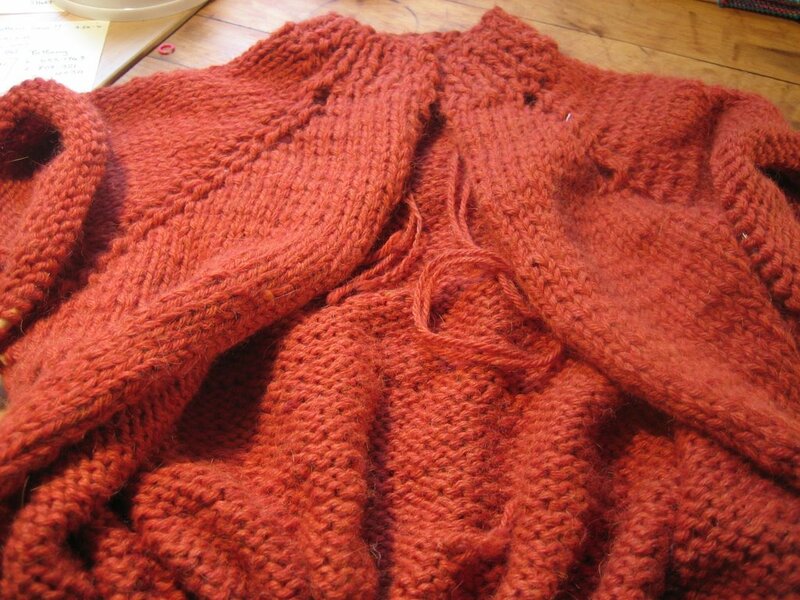 So far, everything I've knit in 2007 has had to be at least partially frogged. Like the Spindle-socks-that-aren't. 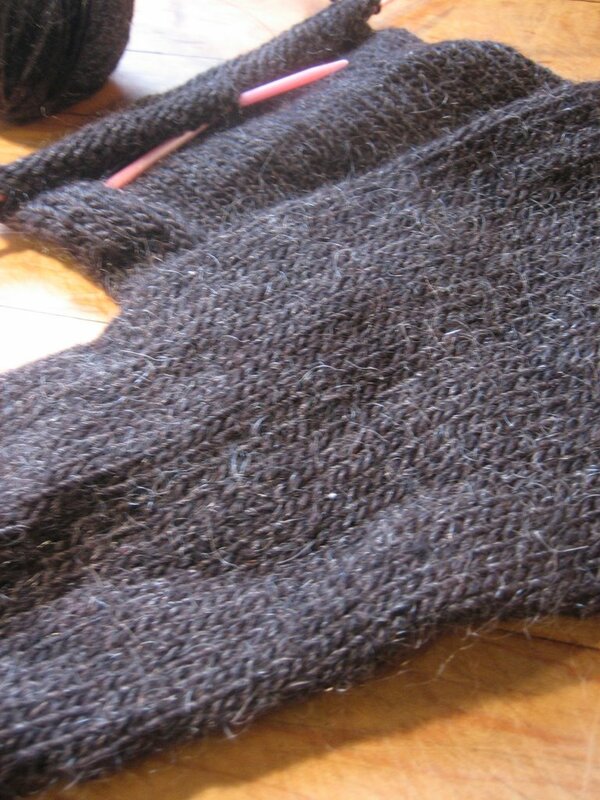 Or the Endpaper mitt disaster, where I repeated two extra rows of the chart, but didn't realize until I was well on my way up the thumb, had to add an after-thought lifeline, rip back and knit again. Sheesh.